The Doctor finds himself involved in the events of the Third Crusade. The Crusade is the half-missing sixth serial of the second season in the British science fiction television series Doctor Who, which was first broadcast in four weekly parts from 27 March to 17 April 1965. The story is set near Jerusalem, in Palestine, during the Third Crusade. Only two of the four episodes are held in the BBC archives; two remain missing. It is the only serial in Season 2 to contain missing episodes. The TARDIS materialises in 12th century Palestine, during the time of the Third Crusade. When the Doctor, Ian, Barbara, and Vicki emerge, they find themselves in the middle of a Saracen ambush. In the confusion, Barbara is seized by a Saracen from behind, while the rest of the TARDIS crew stop the attackers from killing William de Tornebu, an associate of King Richard. Barbara and des Preaux are presented to Saladin's brother Saphadin by El Akir, who mistakenly believes them to be King Richard and his sister Lady Joanna. When des Preaux reveals their true identity, El Akir is furious but, before he can act, Saladin emerges and is intrigued by Barbara, enough to invite her to entertain him with her stories at supper. Ian, anxious to rescue Barbara, asks for the King's help in rescuing her, but the irritated monarch tells Ian that Barbara can remain with Saladin until her death. De Tornebu and the Doctor are able to convince the King to change his mind. Ian is knighted "Sir Ian of Jaffa" so that he may serve as an emissary, and is sent to Saladin's court to both request the release of des Preaux and Barbara, and to offer the hand of the real Lady Joanna in marriage to Saphadin in order to create peace. This makes Joanna indignant and she refuses her consent. Ian delivers his message to Saladin, after which Saladin grants Ian leave to search for Barbara. During his search Ian is attacked by bandits and knocked out. One of the bandits, Ibrahim, ties him down with stakes in the hot sun and daubs him with honey, aiming to kill him via scaphism. Barbara twice escapes from El Akir's capture, hiding out in the Emir's harem on the second occasion. El Akir tries to find Barbara, but she is hidden by a sympathetic harem girl, named Maimuna. Ian eventually tricks Ibrahim into untying his feet, and overpowers him. Ian convinces the bandit to accompany him to Lydda and aid him in his quest for Barbara. Meanwhile, El Akir bursts in and is about to attack Barbara when Haroun - a man who had aided Barbara with shelter - arrives and fatally stabs El Akir. Fatima screams, and two guards burst in. Ian arrives, and he and Haroun subdue the guards. Haroun and his long lost daughter Maimuna are reunited, and Barbara and Ian head for the TARDIS. The Doctor, who has been trying not to get caught up in court politics, attempts to make a break for the TARDIS. He is caught by the Earl of Leicester, who thinks the Doctor is a spy for Saladin. He sentences the Doctor to death. 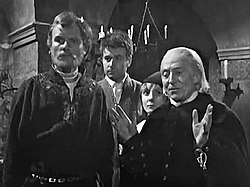 Ian arrives and, presenting himself as "Sir Ian of Jaffa," tells Leicester that the Doctor is a spy and that he is here to carry out the execution. The Doctor plays along and asks for one last chance to see Jaffa before he dies. Leicester agrees, and the Doctor is able to sneak away to the TARDIS with the rest of the crew and leave. Copies of the four episodes were believed lost in the mass deletion of episode recordings in the 1970s, with BBC Enterprises deleting their copies. The BBC Film Library retained a copy of "The Wheel of Fortune" that it had accidentally acquired, but a copy of "The Lion" had been junked from the library by 1972. In 1999, a film copy of "The Lion" was discovered by Neil Lambess and Paul Scoones in the collection of Bruce Grenville, a film collector in New Zealand; the New Zealand Broadcasting Corporation had acquired the story in 1960s, but did not transmit it. The story had been thought to be one of the very few for which no off-air soundtrack was known to exist, until copies were located in 1995. The first episode of the subsequent story, The Space Museum, begins with a brief clip of the finale of Episode 4, "The Warlords", where the time-travellers stand in period costume round the TARDIS console, literally frozen in time (it is confirmed as a clip rather than a restaged scene by an off-camera cough on the soundtracks to both "The Warlords" and The Space Museum). This is the only known surviving footage from the final episode. In episode 3, William Russell appears only in a pre-filmed insert as he was on holiday. Julian Glover was cast by Douglas Camfield to play King Richard I. Glover would return to Doctor Who to play Scaroth in City of Death (1979). Jean Marsh, who played Princess Joanna, would play Sara Kingdom in The Daleks' Master Plan (1965–66) and Morgaine in Battlefield (1989). Marsh was married to Third Doctor actor Jon Pertwee from 1955 to 1960. Bernard Kay had appeared in The Dalek Invasion of Earth (1964). He would later appear in two more serials, The Faceless Ones (1967) and Colony in Space (1971). Roger Avon later played Daxtar in The Daleks' Master Plan. Tony Caunter later played Morgan in Colony in Space and Jackson in Enlightenment (1983). Tutte Lemkow previously played Kuiju in Marco Polo (1964) and would appear again as Cyclops in The Myth Makers (1965). Gábor Baraker had also appeared in Marco Polo (as Wang-Lo). A different version of the final episode of the previous story The Web Planet featured a caption with "Next Week: The Space Museum" instead of "Next Week: The Lion." This alternative end tag was on the version of The Web Planet recovered from Nigeria. In 2008, Patrick Mulkern of Radio Times wrote that The Crusade was "arguably the first story where every aspect of the production works to perfection". He praised the way the TARDIS crew was broken up - allowing them to see both sides of the Crusades – and the "classy guest cast", where "Walter Randall's El Akir is the most sinister character in the series to date". This serial was the third and final story to be novelised by Frederick Muller publishers. 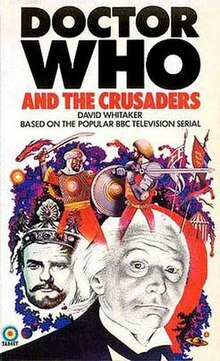 Written by David Whitaker as Doctor Who and the Crusaders, it was first published in 1966 and was the last novelisation published until 1973 when Target Books launched its long-running line of episode adaptations, beginning with reprints of this and the preceding two novels. There have been French, Dutch and Portuguese editions. As with Whitaker's first novelisation, the story is converted into a stand-alone novel with a lengthy prologue in the TARDIS where the travellers discuss the paradoxes of their journeys and time travel. The pointlessness of a religious war is also emphasised more. Once again, Whitaker plays up the romantic potential of Ian and Barbara and includes a graphic passage of Barbara being scourged. For some reason the name of Susan's husband has changed from David Campbell to David Cameron. In 2005 the novel was also issued by BBC Audio as part of the Doctor Who: Travels in Time and Space audio book collectors' tin, read by William Russell. The script of this serial, edited by John McElroy and titled The Crusade, was published by Titan Books in November 1994. It was the tenth in that publisher's series of Doctor Who script books, following Galaxy 4. At the time that the book was prepared, the BBC archives held only one episode of The Crusade on video (The Wheel of Fortune) and no audio recordings. In 1991, "The Wheel of Fortune", then the only episode known extant, was released on VHS as part of The Hartnell Years (BBCV 4608), presented by Seventh Doctor, Sylvester McCoy, with McCoy giving a brief 're-cap' of events before and after the segment, with additional information concerning its 'lost' companions. As part of The Crusade and The Space Museum VHS box set (BBCV 6805/6888) in 1999 a version of episodes 1 and 3, with the events of Episodes 2 and 4 related by William Russell in character as an aged Ian Chesterton, was released in a special presentation package. A compact disc of the other two episodes' soundtracks was also included. The 'scripted' passages, to fill the gaps between the missing episodes and the following storyline were written by Stephen Cole, with additional continuity snippets by Ian Levine. An audio-only version of this story, with narration again by Russell, was released as a two-CD set in 2005 in The Lost TV Episodes Collection One 1964/1965. The two extant episodes and the two soundtracks for The Crusade were again released as part of the Lost in Time DVD (BBCDVD 1353) collection of restored episodes and clips in 2004, with Russell's sections as an extra when "Play All" is selected on disc one. Notably, while most of the episodes in the set were given a new transfer directly from their film prints for restoration, "The Lion" was not as the existing print was very heavily damaged and putting the print through the telecine process was seen as an undesirable risk. Therefore, the 1999 transfer was used as the basis of restoration work. "The Lion" did not undergo the VidFIRE process, while "The Wheel of Fortune" and all other episodes in the set did. ^ a b "BBC – Doctor Who – Classic Series – Photonovels – The Crusade". www.bbc.co.uk. ^ "BBC – Doctor Who Classic Episode Guide – The Crusade – Details". www.bbc.co.uk. ^ a b Mulkern, Patrick (28 December 2008). "Doctor Who: The Crusade". Radio Times. Retrieved 21 December 2012. ^ Shaun Lyon; et al. (31 March 2007). "The Crusade". Outpost Gallifrey. Archived from the original on 30 May 2008. Retrieved 30 August 2008. ^ Molesworth, Richard (2010). Wiped! Doctor Who's Missing Episodes. Telos Publishing Ltd. p. 419. ISBN 978-1-84583-037-3. ^ Whitaker, David (November 1994). McElroy, John, ed. Doctor Who – The Scripts: The Crusade. London: Titan Books. pp. 4, 7–8. ISBN 1-85286-564-4.